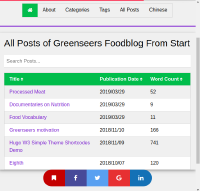 Project Greenseers is a project targeting on spreading scientific information about food and nutrition and and demystifying common misconceptions and myths. As of now this project is mostly me taking notes from other resources available on internet and just collecting them on my website. My aim is to learn as much as possible about food and nutrition (as opposed to general knowledge) and share the same information with the world.